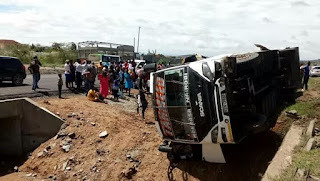 A Tahmeed bus heading to Mombasa was at around 2pm involved in an accident at Machakos Junction. The driver of the bus lost control while trying to overtake. No major injuries have been reported from the incident to the those traveling inside the bus. We would like to advise our driver to be extra cautious on the roads this holiday season.